ITEM #PARKER 12 CASE: A PORTABLE, FOLDABLE PEN PROTECTOR AND CARRYING CASE. HOLDS 12 PENS. Well padded and secure. Pens are held in place by elastic anchors for each pen. ITEM #PARKER 24 CASE: A PORTABLE, FOLDABLE PEN PROTECTOR AND CARRYING CASE. HOLDS 24 PENS. Well padded and secure. Pens are held in place by elastic anchors for each pen. ITEM #4498: BROWN LEATHER SHEAFFER 22 PEN PORTFOLIO. Besides holding 22 pens, this portfolio has two plastic covered pages for paper items. This is ideal for storing, protecting, displaying, and carrying a bunch of pens. ITEM #12 PEN DISP: A CLEAR ACRYLIC STAND THAT WILL SHOW OFF 12 PENS ALMOST VERTICALLY. The top rest has .56" (14mm) semi-circular cut-outs for each pen to rest back in and the bottom surface has .147" (3.7mm) through-holes to capture the nibs to stabilize the pens and keep them in their position. The lower through-holes are large enough to capture the end of a Parker 51's barrel end if you don't want to post the cap. The pens shown are not included. ITEM #2 PEN DISP: A CLEAR ACRYLIC STAND THAT WILL SHOW OFF 2 PENS (or a set) ALMOST VERTICALLY. The top rest has .56" (14mm) semi-circular cut-outs for each pen to rest back in and the bottom surface has .147" (3.7mm) through-holes to capture the nibs to stabilize the pens and keep them in their position. The lower through-holes are large enough to capture the end of a Parker 51's barrel end if you don't want to post the cap. The pens shown are not included. ITEM #44PEN: A FOLDING PADDED PEN PORTFOLIO THAT WILL HOLD 44 PENS, MORE IF THEY ARE SHORT PENS. Designed by Stuart Hawkinson and American made, this high quality carrying case will protect and present your pens in style. Your pens won't fall out, being held in place by either one or two elastic bands, allowing for slimline pens as well as your big fatties. It will accommodate long combos and desk pens as well as tiny Peter Pan type pens. Further protection is provided by a zipper closure, 100% of the way around. There is also a thick, padded inner "leaf" that is bound between the two sides which will pad the pens on one side from those on the other. Course black fabric on the outside and a smooth, silky fabric on the inside. 12 5/8" X 8 3/4" X 1 3/4" when folded and closed. ITEM #PENBOX: ADJUSTABLE LENGTH RIGID PEN PROTECTOR BOXES. Length is variable and can accommodate pens from 4.9" long to 8.5" long. You can use them for shorter pens by using wads of tissue in the ends of the tube. These tubes provide an ideal protection method for storage, travelling, or shipping your valuablepens. ITEM #5440: PARKER LEATHER PEN CASE. HOLDS 12 PENS. Velvet lined inside. ITEM #PARKER 18 CASE: PARKER RIGID HINGED DISPLAY AND CARRYING/STORAGE CASE FOR 18 PENS. Box has ahasp on the front. A parker product in fairly decent shape with a few minor dings in the outer top surface. These show up in the photos. 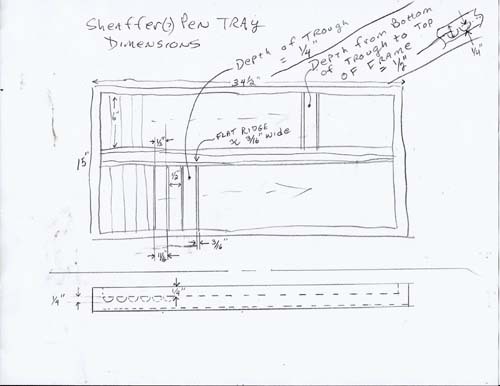 ITEM #ANSONDISPLY: 18" X 7" PEN DISPLAY CASE. WOOD/ACRYLIC/FABRIC. This is a display case for Anson pens configured to display 11 pens on plush, silky fabric pads with elastic loop anchors. This could easily be converted to hold more pens using the molded fuzzy plastic pen display pads if desired. (or, maybe you're a member of the Anson family and/or you collect Anson pens - I have a few new old stock Anson pens listed on my Ballpoints page - you may want to use it as-is.). Also has storage compartments underneath and a lock hasp. This is a very clean display case; the light blotches you see in the photos are sun beams, an artifact of my outdoor photo shoot habit. ITEM #3864: 24 PEN DISPLAY CASE: Wood with glass top and lower drawer. Black velvet lined, 13" x 8.5" x 3.25". Redwood finish. ITEM #WOOD PEN TRAY: WOODEN TRAYS FROM LARGE PEN DISPLAY CASES. These hold 102 pens each and measure 34 1/2" x 15" x 1". I believe these are from Sheaffer display cases. We have 5 available and you can buy one or all 5. Beautiful precision millwork. They don't make em like this anymore! No plastic here.